Today, the Internet is being accessed more via the mobile phone rather than desktop platforms. However, the multiplicity of devices and platforms makes app development on mobile phones a difficult and expensive task. The solution to this problem lies in using a cross-platform mobile app development framework like Meteor. There are so many platforms and operating systems for mobile phones available in the global market today that inter-device installation and the compatibility of mobile apps has turned into a huge challenge. Most of the Web based services for banking, billing, social media, education, games, administration, governance, etc, are available as mobile apps for different mobile platforms. So a prime challenge is to develop apps that can run on multiple mobile operating systems (OSs). Different mobile OSs function on diverse programming paradigms with their own software development kits (SDKs) including Android, iOS, BlackBerry, Windows, MeeGo, Symbian, Tizen, Bada, webOS, Firefox OS, Palm OS, Sailfish OS, ZenUI, MIUI, HTC Sense, LineageOS, EMUI, Cyanogen, and many others. All these operating systems have their own programming model, structure and architecture. Portability as well as compatibility of mobile apps on all these operating systems is a challenge. In the current scenario, the development of a single mobile app that can run on all these operating systems is very expensive, because for each operating system there is a different programming language and scripting technology. A mobile app developed using the Android SDK cannot be executed on BlackBerry, Symbian or any other operating system. For this reason, there is a need to develop mobile apps using cross-platform programming approaches. There are many programming languages and technologies that can be used to develop cross-platform mobile apps. These platforms have excellent features to help you code using the ‘Write once, use anywhere’ strategy, which means that the mobile app will work on all mobile devices irrespective of the OS and architecture. Developers are now creating apps that can be launched on any mobile OS without any compatibility and performance issues. Phone Gap, Accelerator, Xamarin, Sencha Touch, Monocross, Codename One, Kony, Convertigo, Nativescript, RhoMobile, iFactr, FeedHenry, Cocos2d, Unity 3D, Corona, Qt, Alpha Anywhere 5App, etc, are all tools for cross-platform mobile app development. There are a number of platforms and technologies that help to develop cross-platform mobile apps, but many of them are proprietary. Thankfully, there are sufficient free and open source tools available, using which a customised mobile app can be developed and deployed as per the functions and features required. In this article, we look at how to use the Meteor framework for developing apps. Meteor follows the reactive programming model, in which the client application/browser is not only used to display the data, but the reactions on real-time changes and updates are also done in parallel. Meteor escalates the performance of the mobile app as it works in real-time, by default. Mobile apps for different OSs including Android, iOS and many others can be developed using MeteorOS. This framework has excellent features to integrate MongoDB for Big Data and high performance computing in mobile applications. Downloads the latest stable release of Meteor. Installs the required Meteor version. 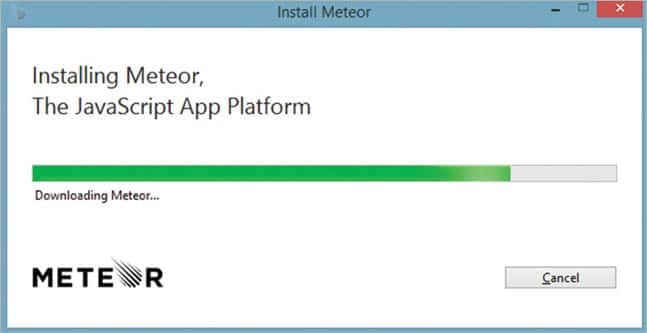 The installation of Meteor in Windows is quite straightforward. 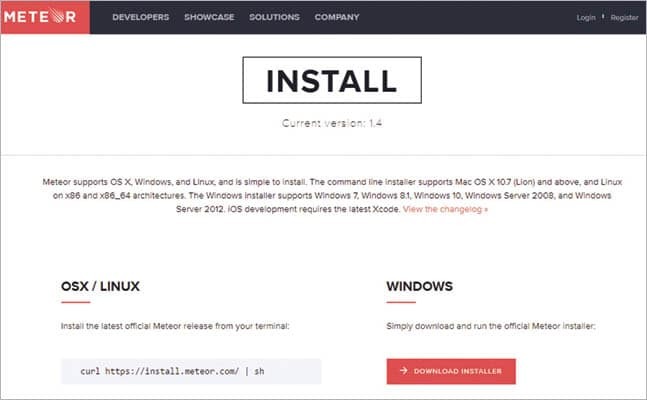 Simply download the installer from the official Meteor website. The installation wizard will install the Meteor framework. Cross-platform native mobile app development. Generation of apps for multiple working environments including Web browsers and mobile platforms. Enormous packages are available for different types of functions and modules. Integration of Meteor Galaxy for compatibility with the cloud. The apps created using Meteor work in real-time, as default. To create a new app in Meteor, the command meteor create is executed in the installation folder. To create the app, run the meteor create command from the command prompt. Any name can be assigned to the app. The results of the app can be viewed on the Web browser at the URL http://localhost:3000/. Sessions are used to store the data when the app is in use. The validity of this data is traditionally up to the browsing of the app by the user. Once the user leaves the app, this data is removed with the destruction of the session. Meteor apps can be integrated with a number of APIs and smart packages to extend the existing features.